“The Tholian Web” begins with the Enterprise searching for the USS Defiant, missing for three weeks. It shows up adrift and Kirk, Spock, McCoy, and Chekov beam over to investigate. For some unexplained reason they all wear bulky environmental suits – something nobody has ever done before when beaming into a hazardous situation (or even down to an alien planet). Of course the suits still allow you to see the actors’ faces. The Defiant crew are all dead, apparently having killed one another. In fact, they are sprawled in incredibly unlikely poses across consoles and furniture, more like they’ve been artfully arranged. 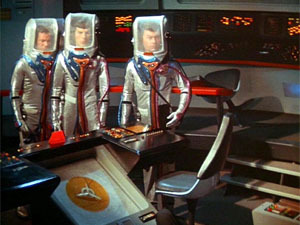 Chekov asks if there’s ever been a mutiny in Starfleet before, and Spock declares there is “absolutely no record of mutiny on a starship before”. I guess he forgot about Gary Mitchell, or even himself telling Captain Pike, “I know it is treachery and it is mutiny, but I must do this.”. The Defiant begins to fade out like some futuristic Brigadoon, and of course there’s a transporter malfunction, meaning someone has to stay behind. Spock volunteers but Kirk, being the captain and therefore less important, orders Spock back to the Enterprise while he stays himself. When the others beam back, they immediately take their suits off, without any sort of decontamination procedure. Bad idea, as soon Chekov begins to go nuts, attacking fellow crew members, until confined to quarters. Meanwhile, the Defiant disappears, taking Kirk with it. Some aliens appear to complicate matters, the Tholians, who warn the Enterprise to leave their territory immediately. They don’t take Spock’s “rescue mission” answer kindly and start wrapping the Enterprise in the most intriguing thing in the episode – some sort of space web made of energy. McCoy uses the time to mix bright primary coloured solutions in the med lab, searching for a cure for the plague of aggression running through the ship. He says it’s caused by the region of space, which is unstable and should bring the Defiant back so they can rescue Kirk some time in the near future. Alas things go poorly and everyone decides Kirk must be dead. Spock gives a perfunctory eulogy, then he and McCoy open Kirk’s sealed message, only to be played when he is dead. Kirk basically tells them to get along better. Uhura sees a ghostly image of Kirk and is confined to sickbay on the assumption that she’s going nuts, but when others see it, they take it as evidence that Kirk is still alive and ready to be rescued when the Defiant reappears. They do so, and beaming Kirk back aboard somehow causes the Enterprise to be thrown several parsecs clear of the Tholian web (which was of course seconds from being completed), thus completely circumventing the only thing that really had us wondering how they’d get out of this one. The amusing ending consists of Kirk asking Spock and McCoy if his last orders were helpful, and both of them sincerely replying that they didn’t have time to view them (marking an occasion when Spock tells a bald-faced lie for no apparent logical reason). The most intriguing thing about this episode is the energy web the Tholians are weaving about the Enterprise, and the dramatic tension as it approaches its completion. What will happen then?! And this is completely defused in a deus ex machina escape. But overall it’s not terrible, and does hold interest throughout, even if it’s defused lamely at the end. Slightly below par. Tropes: Ghost Ship, In Space Everyone Can See Your Face, Brigadoon, Phlebotinum Breakdown, Russian Guy Suffers Most, Space Madness, Door Jam, Beehive Barrier, Technicolour Science, Hate Plague, Video Wills, Just In Time, Deus Ex Machina. Body count: Entire crew of the USS Defiant (pre-credits). This entry was posted on Saturday, 16 July, 2011 at 20:18	and is filed under Star Trek. You can follow any responses to this entry through the RSS 2.0 feed. You can skip to the end and leave a response. Pinging is currently not allowed.